Patterson Sales, Inc. - PDQ Mfg. PDQ Manufacturing offers a family of architectural locks that are domestically manufactured; BHMA certified and go beyond the limits of ANSI standards. With PDQ you can be assured that all their domestic locks offer superior specifications, superior strength, superior security and a superior warranty! PDQ's family of locks includes Mortise style locks and a wide variety of cylindrical style locks. 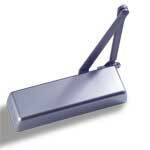 PDQ also offers a wide variety of door closers and exit devices to meet virtually every situation! PDQ Manufacturing's website is: http://www.pdqlocks.com/. No two products are exactly alike. Although this statement is true, it is possible to cross reference the American Eagle lines of commercial exit devices and door closers against the Cal Royal, Corbin / Russwin, Dor-O-Matic, Dorma, Hager, LCN, Norton, Sargent, Yale, Monarch, Precision and Von Duprin product lines. These representations represent a judgement of products that are most similar. It is not represented nor guaranteed that any product exactly equals any other product.